Oh, this is such a pretty kit! In addition to the 3 lovely papers from the Scrap Studio Collection, there is a new collage sheet (designed to match the palette of those papers and also designed to fit the new Arched Tent Card Frame — also include in this kit). 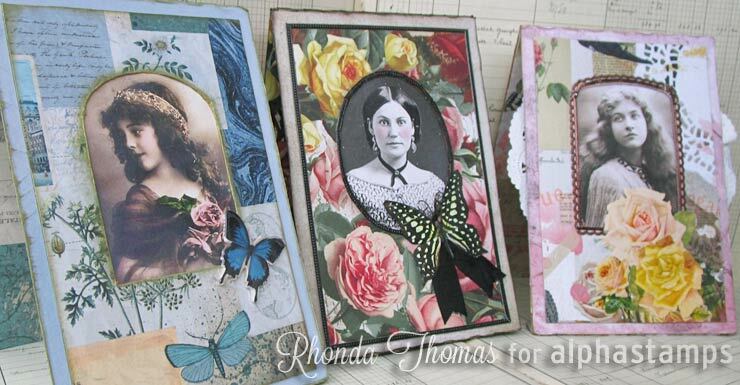 Beside 3 options for frames, the collage sheet includes some extra roses, butterflies and text to embellish your frame. And there is an exclusive set of Dresden trims, only available in this kit (4 strips in a chocolate brown that looks so perfectly vintage)! See the "We Also Recommend" section below for photos/links to most of the items in the kit — the ones that are available to purchase separately.